It’s the holiday season again. A million things on your to-do list, gifts, cards, wrapping, cleaning, cooking, last minute shopping, visitors, etc. And you get so caught up in this mess that holidays seem like a nightmare, and everyone and everything seems to stress you more than usual. Does it have to be like this? I vote ‘No’. Honestly, I already gave up on so many things that the old me (before kids and family) took very seriously, and couldn’t do without. Cleaning until the house shines and sparkles? Whom are you kidding? And besides, with kids around I doubt it is even possible. Buying dozens of gifts and stressing about being late with finding the right ones for everyone? Come on now, I think ‘less is more’ concept is very IN now, especially in our house. I know the kids will be happy with some silly nonsense from their stockings anyway. Why stressing for no reason? Cooking and baking to impress food critics? Oh please, those days are in the past when I had hours of free time and more cookbooks than a sane person needs. As long as it is healthy, quick, and easy to clean up afterwards, I am game. Instead, I try to spend more time with kids doing things THEY enjoy. Like decorating a tree. And then ripping everything off (not my idea) and redecorating again, and again. Or making our gingerbread house from scratch and decorating it in the craziest way possible, and destroying the kitchen in the process. Or making real hot chocolate and whipping our own cream, and then watching something cute on TV while sipping our creations. Ok, maybe they are watching (once in a while) and I am catching up on something I really wanted to do for myself, by myself. Don’t judge me. Now, just don’t get any ideas that my life is completely stress-free like some old Christmas movie. It is not. I just try to analyze and see what it is that stresses me, and if it is something we all can do without at the moment for my sanity’s sake (like that sparkling clean house, or neatly folded laundry on a daily basis), then I add one more thing to my ‘take-some-things-easier’ list. I will keep them there until I have more free time, some day, maybe. 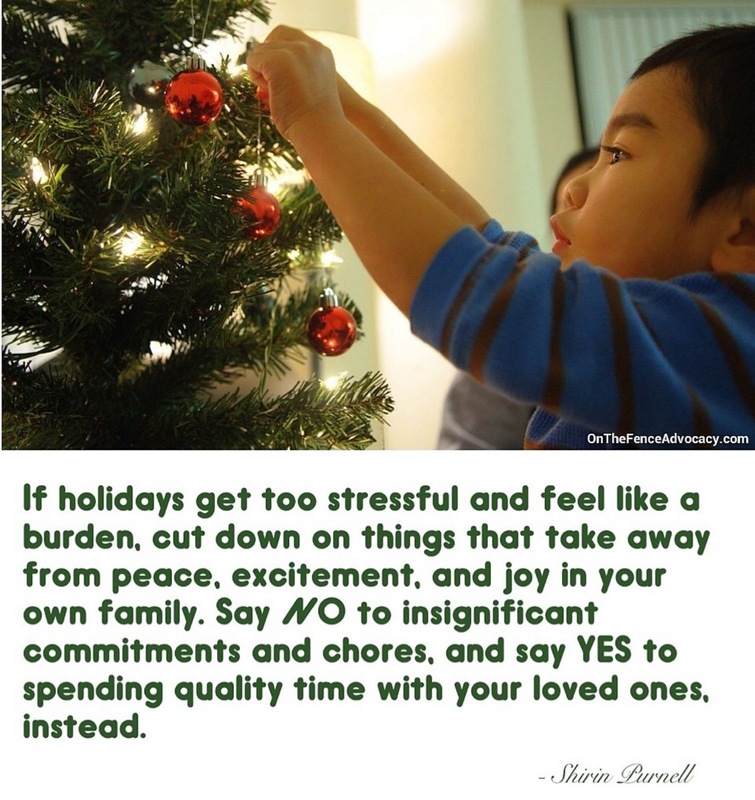 But until then…breathe in, breathe out, and go hug your kids instead.